It really is fall now – chilly nights, leaves turning colors, and overheated apartment buildings (ok, that one’s just me at the moment). The return of fall also means the return of butternut squash! I never ate it much growing up, but I have been fully converted to their awesomeness. So I based this week’s recipe on this 5-ingrediant pasta dish, which I found via Buzzfeed. Chop the butternut squash into smallish chunks and toss with the olive oil, salt and pepper. Cut the tops of the garlic cloves off and stick on a baking sheet with the squash. Roast at 400 until tender. While the squash is roasting, boil the pasta until done (I used macaroni because that was what I had, but the suggestion from the recipe I based this off of was penne). Drain the pasta. Once the squash and garlic are done roasting, mince the garlic. 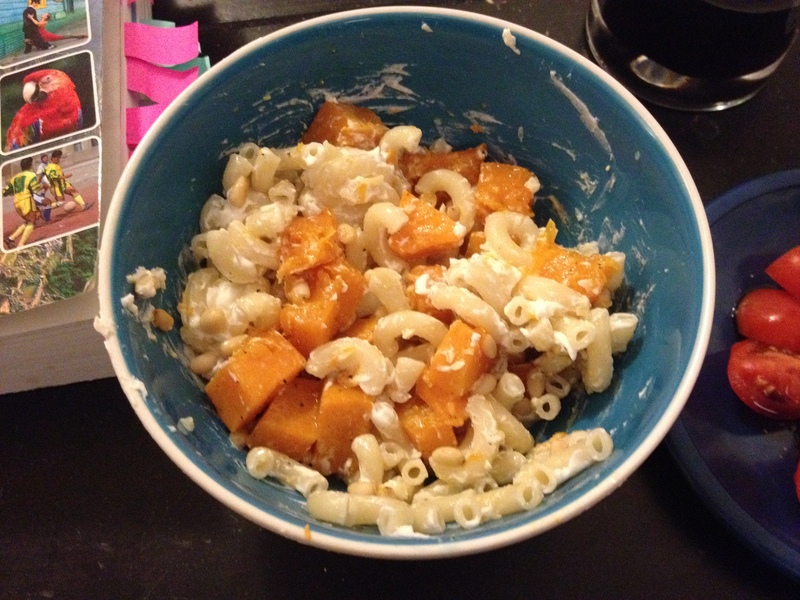 Toss the pasta with the garlic, a little oil, and the goat cheese, add the squash and pine nuts. Serve warm. This was really tasty! A bit heavier and more filling than I expected, but extremely tasty. I was surprised that it didn’t take too long to put together either. So you should totally make some sort of version of this! Naturally, since its fall, I have moved on to red wines with dinner. This one was a cab-heavy South African blend. I know I’m pretty skeptical about South African wines, but I’ve had a couple red blends I’ve liked. Song of the Week: Take On Me by A-ha. So this weekend I read Ready Player One by Ernest Cline, which btw, is super entertaining – I totally recommend it. Since part of the point of the book is an obsession with 1980s culture, I listened to an 1980s pop soundtrack while reading it. I was debating a lot about which song should be up for this week, but Take On Me is just so 80s, so it won.